Users can easily make all of these format adjustments using the ribbon or shortcut keys. However, figuring out after the fact which styles have been applied or where a particular bit of formatting comes from can take some work. The ribbon can indicate some of the formatting that has been applied, but not all of it and not consistently. For example, the Styles section of the ribbon and the Styles pane indicate at most one applied style. If both a paragraph style and a character style have been applied, the field will only indicate the character style. The ribbon also doesn’t disclose whether the indicated style has been overridden by manual adjustments. A solution to this problem is available via the Style Inspector pane the Reveal Formatting pane. Unfortunately, Microsoft has hidden the former—neither a button on the ribbon nor a built-in shortcut is provided. And access to the latter is only slightly better. 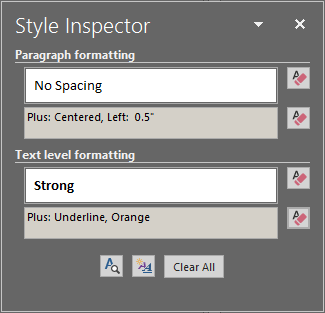 The Style Inspector pane (Figure 1) provides a summary of the formatting applied at the current cursor location, indicating the names of assigned paragraph and character styles (in white fields) and manually applied paragraph and character formatting (in gray fields). Beside each field is a button that allows the user to reset that particular type of formatting. And included at the bottom of the pane are buttons to launch the Reveal Formatting pane, create a new style, and clear all formatting at one time. While the interface clearly lays things out for the user, more is available if you poke around. If you want to see what formatting the styles provide, you need to hover your cursor over the respective fields. (Or you can bring up the Reveal Formatting pane). The paragraph and character style fields are also drop-down menus that provide access to additional commands. Some of these duplicate the functions of other easier-to-access buttons, though. Another not-immediately-obvious quirk of this pane is that it provides clearer information if you have placed your cursor within the text you want to analyze rather than selected the text. If you select text that contains more than one paragraph style, the paragraph formatting field will appear empty; the same happens if your selection contains two character styles. But seeing a blank field at least indicates a problem. If, however, you select text containing two or more manual character format changes or paragraph format changes, the field will identify only the first one in the selection. However, the buttons will still remove formatting, whether or not the fields identify it. NOTE: Microsoft Office Word 2007 Essential Reference for Power Users by Matthew Strawbridge indicates two additional lurking issues. The first is that the manual paragraph styling field does not indicate all types of paragraph formatting. Unfortunately Strawbridge doesn’t state which ones. The second is that the text-level field will not indicate that any formatting has been applied if you place the cursor at either end of a stretch of formatted text. The Reveal Formatting pane (Figure 2) provides a detailed list of formatting at the font, paragraph, and section levels and acts as a nice supplement to the Style Inspector. The “Distinguish style source” toggle, located at the bottom of the pane, adds headings to the list to clarify which formats have been manually applied and which are applied via a style. This is particularly useful because it indicates when a paragraph style includes character-level formatting. The “selected text” field is also a drop-down menu providing access to a few additional commands. Another useful feature is the “Compare to another selection” option that indicates how the format of two selections differ. This tool is toggled on and off using the control near the top of the pane. Unlike Style Inspector, Reveal Formatting does have a predefined shortcut key: Shift + F1. Unfortunately, it does not include a button to launch the Style Inspector. (This is another reason to set up a Style Inspector shortcut). The “Show all formatting marks” toggle at the bottom on the page simply duplicates the “show/hide ¶” toggle on the ribbon. This pane doesn’t provide any way to adjust styles, though there is a Clear Formatting option under the Selected Text drop-down menu. If the selected text contains more than one character or paragraph style, the field only identifies the first style. Multiple applications of manually applied styling also causes this misreporting. The drop-down menu commands “Apply formatting of surrounding text” and “Clear formatting” really only work as expected when applied to selections.